Private dining at Germano's will make any meeting memorable and any event a celebration. Let your friends, family or associates enjoy the extraordinary culinary delights of our Chef. They'll be pampered by the flawless service of the hospitable and personable Germano's staff. 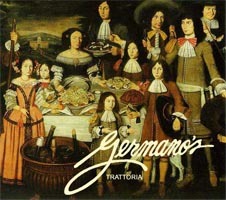 Make it Germano's for your next meeting, party or family gathering. The sample menus below offer a few possibilities to consider in planning your group's event. Menu development at GERMANO'S is quite flexible, and the restaurant welcomes the chance to discuss each host's unique vision, tastes and budget--and to customize each menu, accordingly. GERMANO'S has had much success with Family Style service, where large bowls or platters of a selection of appetizers, entrees and desserts are presented to each table, allowing guests to share and sample several different dishes. Other formats are available, including buffet service and pre-selected menus from which guests may make individual choices. All food menus for groups are at a fixed per-person cost. Beverages (including coffee, tea and soda) are charged separately on an "on consumption" basis. All food and beverage charges are subject to 6% sales tax and 18% gratuity. We will be glad to review your needs, work with you to select the right room and configuration, accommodate your A/V needs, and help enhance your event with floral arrangements, music and more.